We are glad to let you know that Antonia, the winner of our Layout Challenge, is staying with us as a Guest Designer during the Summer. Here is her first project, and we look forward to seeing more of her upcoming layouts! Hello Pion Design’s fans! It’s Antonia Moreno here with you today as Guest Designer for this summer! It’s a pleasure to share with you some of my projects with these wonderful papers from Pion! 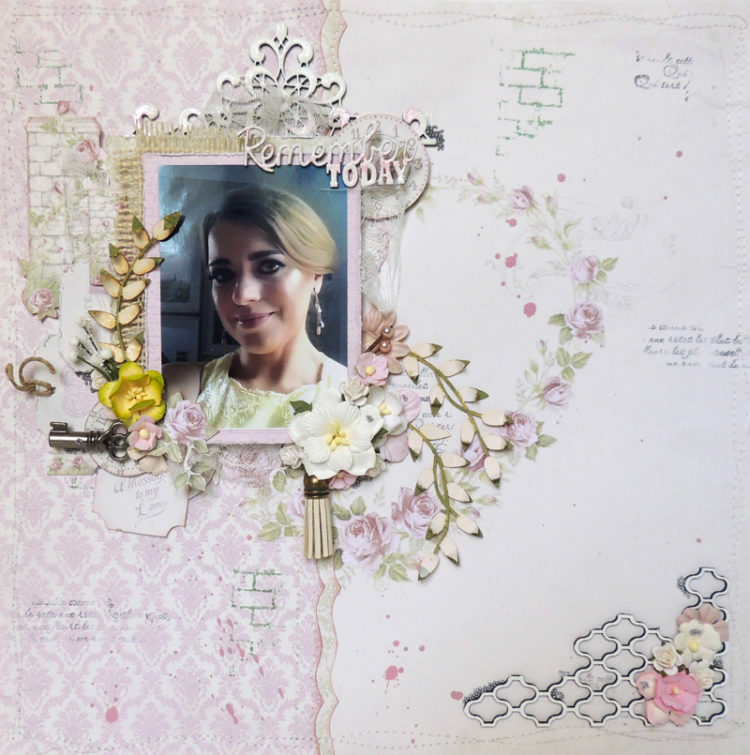 For this first project, I created a layout using the stunning Where the Roses Grow collection and my friend Maite’s photo on her wedding day. This collection has a very romantic and sweet design, and it is full of flowers (I love them!). As base of this layout it was used With all my love paper, that shows a central roses heart, which I fussy cut to add the back of that same paper and the Scent of Roses too, in which I used a Martha Stewart border punch. Afterwards, all papers were machine sewn with white thread: easy to do and a great effect on the project! The background has been stamped with two different stamps and some drops of pink acrylic paint. 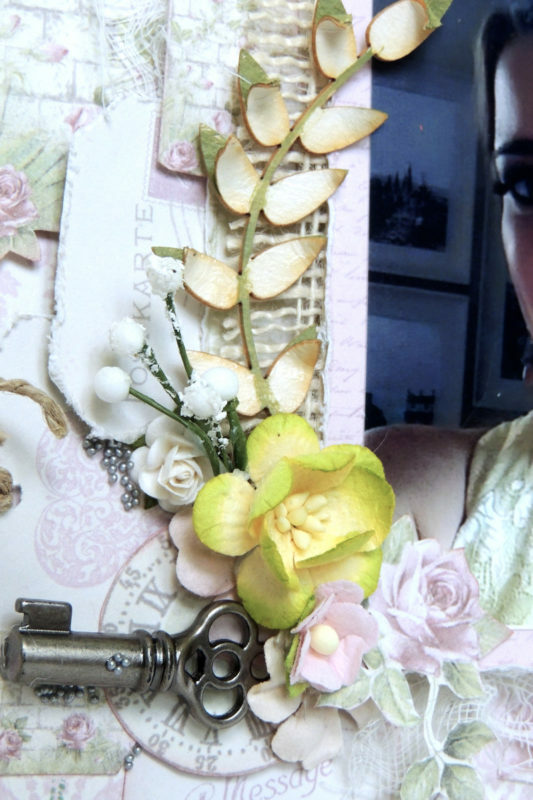 I also like to add chipboard: it enhances the beautiful papers. 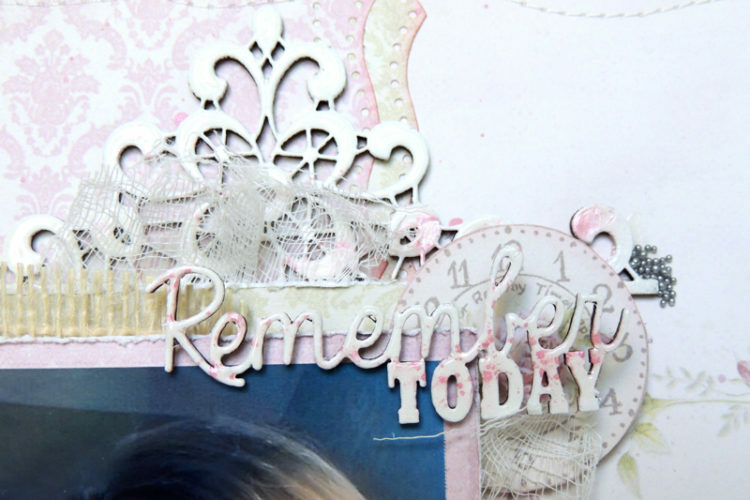 Most of them have been white embossed and, while still wet, I added a bit of Mica powders in vintage pink. One of them is the main title for this Layout. But I wanted something attractive for the wooden branches, as they surround the photograph, so I hand-worked with them using water to open the leaves and painted them afterwards. This gives a global dynamic look, don’t you think so? One of the things I like the most of Pion Design’s papers is that they give you lots of options to be cut. On this photo you’ll see some of these possibilities: a stone wall, flowers, texts, clocks or tags. I also forgotten to add some butterflies before taking the photo, but some of them were added afterwards. Hope you liked it. See you soon with another layout! Enjoy!